I don’t know where I am. I don’t know how I got here, no memory of anything before I opened my eyes. I don’t even know who I am. Nik doesn’t remember volunteering for the mysterious Test, a series of brutal physical and mental trials. She doesn’t remember who she was, why she chose to risk her life . . . or why Forrest, the boy with strange abilities and even stranger secrets, is determined to ensure her survival. All Nik knows is that she has to win -- no matter what. Where did the idea for The Test come from? I’d had this idea swirling in my head about a girl trapped in an intense life-or-death scenario, without much of a clue to the why and how she was there, only that she had to survive somehow, someway. Which spectrum of sci-fi does The Test lean towards – hard science or fanciful? Definitely fanciful! The “science” in here has some roots in hard science, but the majority is based on obscure possibilities and futuristic dreaming. 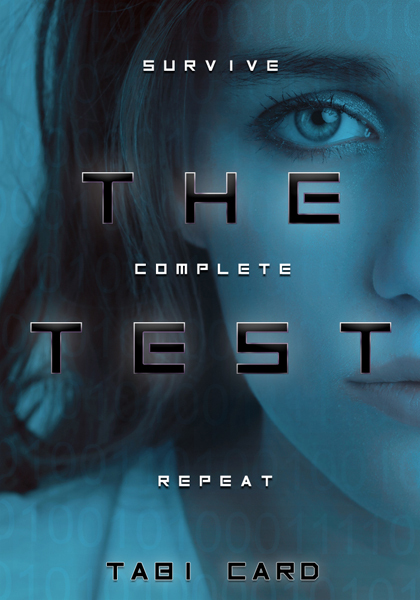 The Test obviously deals with some sort of virtual reality since it’s reminiscent of The Matrix, so are there aliens? Virtual-reality is a huge part of The Test, but I really can’t say anything else beyond that without giving away the oh-so-dramatic and shocking plot reveal! I did think about tossing aliens into the mix and then decided against it. So if you’re hoping for some creepy E.T.’s you won’t find them here. Can you share any hints about events/things in The Test? I can neither confirm nor deny that there is a spaceship. Nope. I thought about it (a lot), and while there are openings for possible companion books, The Test has a definite ending. How would you describe The Test? Like a crazy-dangerous roller-coaster with a very high chance of killing you . . . but of course that only makes you want to ride it even more.